Toss three balls at the Tic Tac Toe board. Land three balls in a row to win! 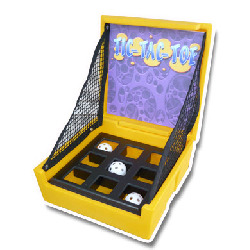 The Tic Tac Toe Carnival Game is a classic that’s fun for all ages. Perfect for carnivals, fundraisers, and large events. Easy to operate, maintain, and attend. Book this Tic Tac Toe Game now with Charlotte Party Rentals!